You’ve heard it before, the children are the future, which means that you want to start teaching them now about how to be more green and how to do more for sustainable and healthy living. The best way to do this, of course, is to lead by example. Here are some things you can do to help your kids learn how to reduce their carbon footprint and help the earth. There are plenty of bad things that put pollution into the environment, from the vehicles we drive to the factories that create the things we eat and use. However, one of the worst things people do to the air we breath is fill it with cigarette smoke, which is made up of many carcinogens. Not only do you work to kill or harm yourself as a smoker, but also those around you. Lead by example and quit smoking if you’ve already started. It seems that children of smokers are more likely to become smokers themselves. You can teach your children to be more green, and save more green, by teaching them how to live more sustainably. Teach them how to raise animals, like chickens, for food. Teach them how to garden and grow their own herbs. This may seem like a lot of work, but if you teach a child to fish you never have to worry about him starving when you’re no longer around to take care of him. There are many great ways to teach children about energy, but you want to do more than just teach them about consumption, you also want to make sure they know about ways to save energy and to cut utility costs. You may be surprised how much you save on your energy bill when you teach your children these tips. Teach them to unplug items when they are not in use, don’t just turn them off. Buy them an energy strip to make this easier. Also, teach them the importance of shopping for more energy efficient devices and appliances. By teaching your children how to use less, reuse what they can, and recycle what they cannot use, you are creating well rounded children. 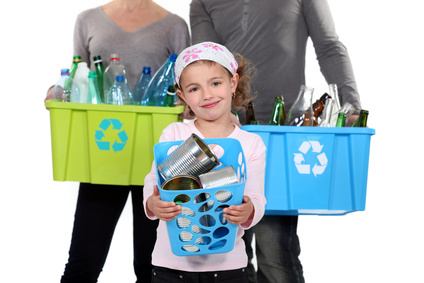 Have your children help you create a recycle bin, and have them come up with creative ideas for things like old magazines, newspapers, and used clothes. You can also take them by a trash dump so that they can see exactly what happens with garbage when it leaves your home. This is a great way to teach them how to be more conscience of what they use and do each and every day.